TELEKS is the first private-owned company to provide services for implementation of telecommunication infrastructure in Macedonia, as well as the leading provider of fiber optic solutions. Backed by ISO 9001:2008 management system, 30 years of experience, cutting edge technology and highly qualified staff, TELEKS offers highest standards with persistent results. 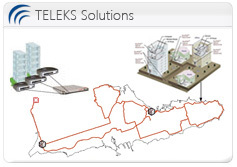 TELEKS has implemented more than 400 infrastructure projects that span on more than 4000 km. TELEKS is specialized in the delivery of cost effective, timely and scalable infrastructure solutions to carriers and service providers. Our goal is to constantly improve processes, technology and human resources, in order to develop sustainable telecom infrastructures that generate higher levels of value for our Clients. Click here to learn more about TELEKS. TELEKS manages an extensive high-capacity fiber-optic network that spans through key destinations in Macedonia. Our future proofed fiber infrastructure offers virtually limitless capacity. Service providers and large companies can leverage our highly competitive rates and jumpstart with high-speed connectivity in no time. Get in touch with us today to learn more about our cost-effective and carrier-neutral fiber infrastructure. TELEKS offers turn-key solutions for fiber optic projects, including certified project design, project management and implementation, infrastructure construction, comprehensive testing and analysis, system integration and 24/7 maintenance services. TELEKS has implemented more than 400 projects that span on more than 3.500 km. We have the know-how to design and build any fiber based facilities using various architectures, such as FTTx, long-haul, metro, GPON. For more details, please click here. Fiber optic lines are the best communication infrastructure to carry digital payloads. They provide 1000 times more bandwidth for the high-performance networks, as well as broadband data speeds of about 100 times the speed of current DSL used for the residential Internet connections. Moreover, they are environment friendly, because they provides huge savings on space, and less power to operate on equipment. Click here to see complete list of advantages. Copyright © 1993-2019 TELEKS DOO. All rights reserved.